One of the major challenges in maintaining a computer server and network is trying to predict what will fail and when. 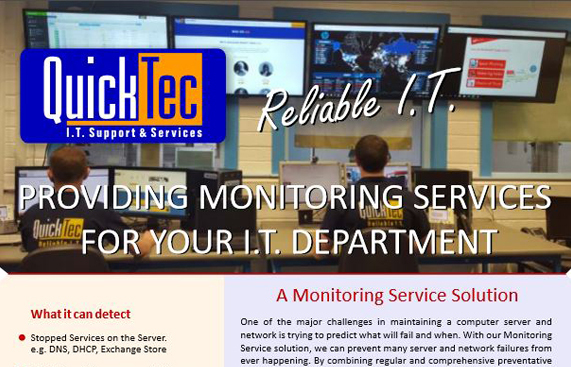 With our Monitoring Service solution, we can prevent many server and network failures from ever happening. By combining regular and comprehensive preventative maintenance and robust real-time monitoring of your critical server, network and desktop devices, we ensure the reliability and stability of your IT assets. Our solution is so effective that our customers see almost immediate results. A regularly maintained server and network means fewer failures, yielding higher productivity and savings on support costs to you. At the same time, your exposure to security risks is dramatically lessened, and frustration from unstable IT resources almost vanishes. It allows you to focus on the core business functions by taking the worry out of owning a computer network. Through regular, preventative maintenance activities designed to keep your server and network operating efficiently, you reduce the number of emergency incidents your encounter. 24x7x365 Advanced Performance Monitoring ensures all of the critical server and network devices that comprise your business network are healthy and are functioning optimally. Schedule Preventative Maintenance ensures that servers, PC’s and other vital network devices are functioning reliably and securely. Security Management Services ensure your Anti-Virus and Anti-Spam solutions are performing optimally to protect your business. Patch Management ensures all your Windows servers and PC’s have the most up-to-date security and system patches, helping to optimise performance and minimise security risk.